Newspapers are many. But how many of them really satiate the information needs of the readers? A very few. This is more so in the case of Urdu readers. These newspapers either have their own agenda or go in for cascading advertisement revenue. Ultimately the reader feels that he has not been served the news he wants to read. It is here that ETEMAAD is going to make a difference. We, at ETEMAAD, will provide you news that will help you know whatever that is happening around you; in your city, state, nation and the world. And all this will be presented in a manner that is easy to read and pleasing to the eye. It will give place to news and views that will help you form a right perspective about the happenings. 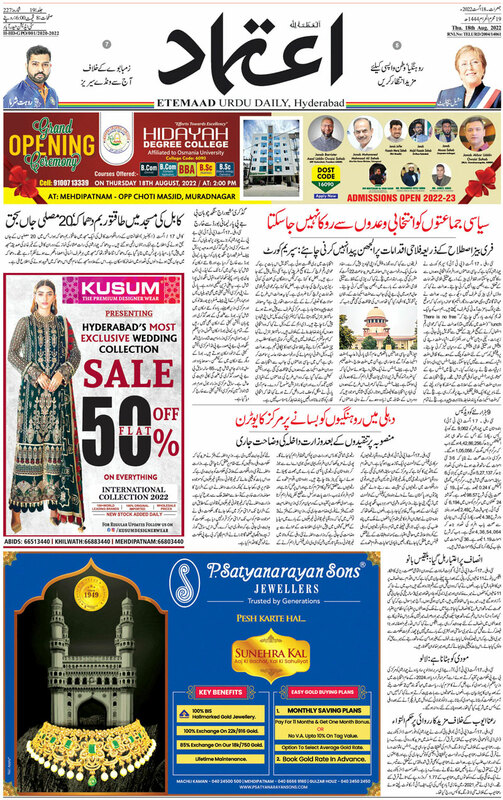 Etemaad Urdu Daily, Publish from Hyderabad, India - Indian Leading Urdu Newspaer, Newspaper is Multi Color. All trademarks, trade names, service marks, copyrighted work, logos referenced herein belong to their respective owners/companies.